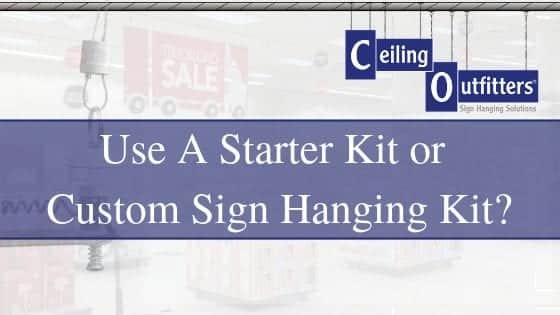 Hanging and changing ceiling signs can be tedious and sometimes dangerous. However, it doesn’t have to be with the proper banner hanging system. 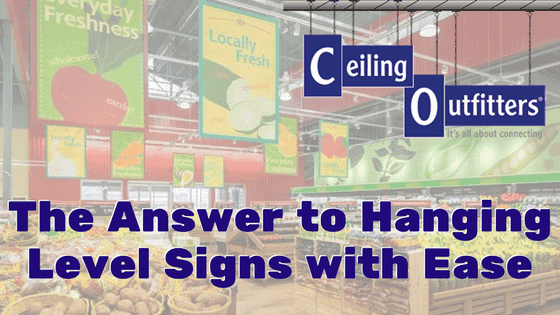 At Ceiling Outfitters®, we’ve solved these challenges for retailers by offering the hanging sign hardware needed to easily hang ceiling signs and displays without the danger or hassle associated with the traditional sign hanging process. The ClikMagnet™ is a permanent neodymium magnet that connects the sign to a magnetic surface like drop and open-beam ceilings. The innovative connecting cord, LoopLine™, replaces traditional sign hanging string, rope and wire. Made from repeating two-inch loops, LoopLine is easy to measure, cut and with a sturdy connection, join the ClikMagnet to the sign. When each line has the same number of loops, the sign hangs level. The MagPole™ is a durable and portable telescoping installation pole that is easily maneuvered to reach the height of the ceiling. The MagMover™ easily connects to the MagPole and transports the ClikMagnets to or from a magnetic surface. Retailers across the U.S. have known for years that the Clik-Clik sign hanging system works seamlessly with magnetized surfaces. 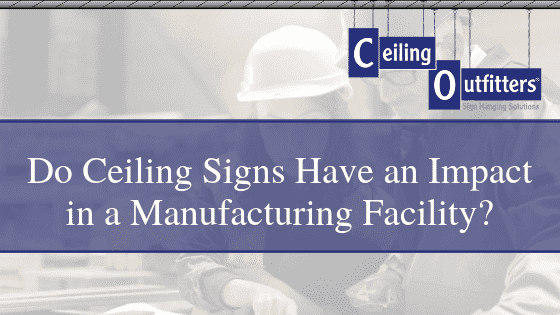 However, in retail and other business environments, signs and displays often need to be hung from finished drywall ceilings or presented in display windows, both without a steel surface. Therefore, managers and merchandisers have been hesitant in hanging signs and displays in more challenging areas like display windows, slanted ceilings or non-magnetic surfaces. Thankfully retailers can recapture these display spaced using Ceiling Outfitters’ Display Window Metal Plate™. Go ahead and utilize non-traditional surfaces like slanted ceilings and non-magnetic surfaces. 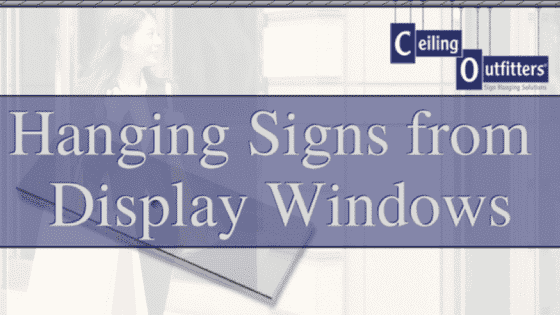 The Display Window Metal Plate allows you to address these challenges and successfully hang ceiling signs. Create a “ClikSpot” with the Display Metal Plate which provides a magnetic surface that receives the ClikMagnet™. Be sure and follow our precise instructions included with each metal plate order. Once the plate is secured in the correct location, like the underside of the top rail of a window or a drywall ceiling, a ClikMagnet can be easily attached using the MagPole™ and MagMover™. When used with the Clik-Clik magnetic hanging system, signs and displays are easy to install and change in windows and other non-magnetic surfaces. 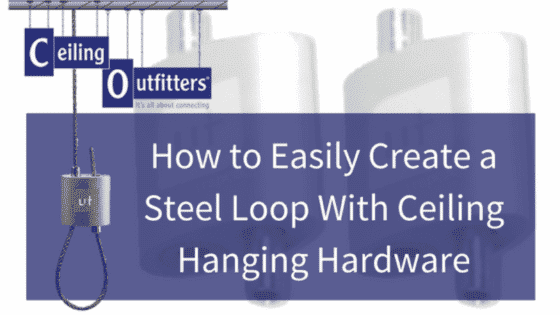 For a more secure connection, the metal plate can also be installed with a screw toggle or molly bolt through a center hole. This is recommended when applying to wood, plaster or drywall surfaces. Note: The plate is offered in one size and color: 3.0 inches long (7.62 centimeters) x 1.06 inches wide (2.7 centimeters) x .10 inches thick, with a white powder coat. The ability to access these complicated display areas can be a game changer for some retailers, as window displays and unique advertisements serve as a first impression, generate foot traffic, reach a large audience, and even help build or reinforce a brand. Recapture the maximum ad space in your retail windows by utilizing the flexible and innovative hardware savvy retailers use every day.